Both are springboards for the mergence of new fearsome global competitors. This book aims to shed light on the brutal competition for markets and resources in China and India as well as lays out the strategic action implications for those companies who want to emerge as the global players of tomorrow. Anil K. Gupta is the Ralph J. Tyser Professor of Strategy and Organization at the Smith School of Business, The University of Maryland at College Park. A world-renowned scholar on global strategy, he is a regular speaker at major conferences and serves as an adviser and director for corporations in the United States, Europe, and Asia. Haiyan Wang is managing partner of China India Institute, a research and consulting organization. Drawing on her experience in China, Singapore, Europe, and the United States, she consults with companies and speaks at conferences on smart globalization in the age of China and India. Gupta and Wang Speaking Engagements Find out where Gupta and Wang are speaking next, how to reach them, and more. Inside the Deal: Smith School's Anil Gupta on M&A in China and India Economic growth in China and India may be projected to slow in 2009, but that doesn't mean opportunities for foreign buyers will dry up. In fact, the opposite is true. In this edition of Inside the Deal, Anil Gupta, professor of strategy at the Smith School of Business and author of the forthcoming book Getting China and India Right, tells Suzanne Stevens that the opportunity to acquire attractive targets in those developing countries - at bargain prices - has never been better. The Wall Street Journals Carol Hymowitz interviews Dr. Anil K. Gupta The Wall Street Journals Carol Hymowitz interviews Dr. Anil K. Gupta about how foreign companies can develop markets for their products in China and India. Wall Street Journal Interview with Anil Gupta Anil Gupta, of the Robert H. Smith School of Business at the University of Maryland, talks to WSJ's Carol Hymowitz about how companies are building new business models from the ground up as they move into China, India and other developing countries. 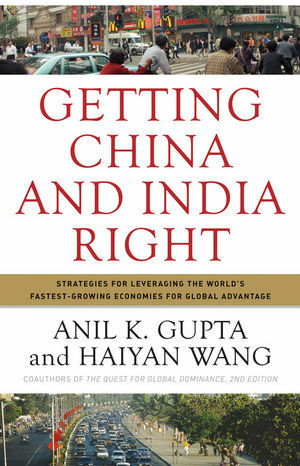 Wall Street Journal Interview with Anil Gupta and Haiyan Wang In the April 28, 2007 issue of the Wall Street Journal, Anil Gupta and Haiyan Wang tell how to get China and India right. VISIT THE AUTHOR'S WEBSITE AT www.gettingchinaandindiaright.com for videos, author blogs, and more!